Despite what many influencers on Instagram might have you believe, working out isn't all smiles, high fives and feel-good endorphins. There are some mornings where it's really hard to find the motivation to simply put on your trainers and muster the energy to leave the house. If you've started the year with good fitness intentions, your enthusiasm for those 6am spin classes might now be flagging - especially if your results have plateaued. If you started the year aiming to lose 20 pounds, it's easy to give up a few months in when you're still miles from your end goal. "Whatever your long-term fitness target, break it down into small and achievable goals," says Forster. For instance, if your dream is to get fit enough to run a marathon, he advises creating micro goals with short-term achievements, like completing a 5K first. "By creating smaller goals, you'll build a foundation that makes the training rewarding, attainable and ultimately more enjoyable." "Eating a well-balanced diet can help you get the calories and nutrients you need to fuel your fitness targets," says Forster. If you're going into your workouts feeling fatigued and lacking energy, it could be a sign you need to reassess what you're eating. Make sure you're getting the right balance of protein, carbs and fats to support your efforts on the gym floor. "Remember, you can't out train an unhealthy diet." Failing to jump out of bed for that 7am run? Rope in a couple of friends. 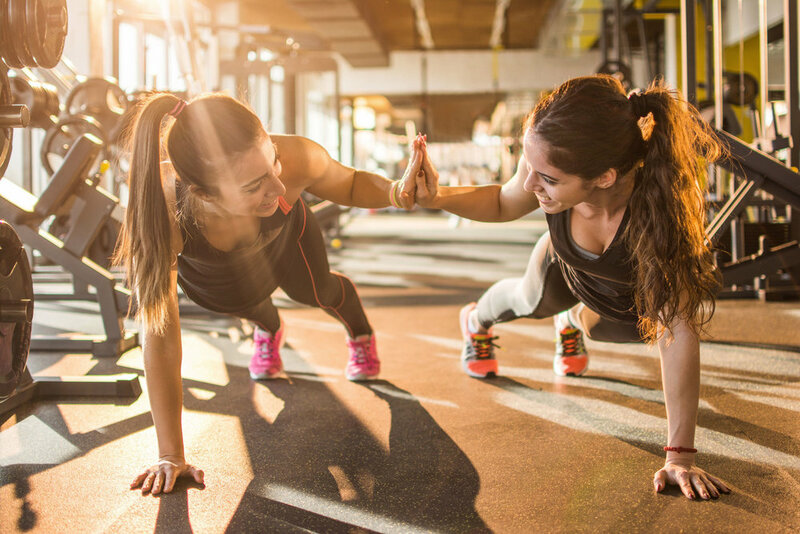 "Having a support system of friends, or a group with similar fitness targets or exercise interests, allows for greater group accountability," says Forster. "These peers will keep you engaged, motivated and are great to lean on during some of the usual training challenges." Instagram is great for fitness inspiration, but our digital devices can, at times, serve as a distraction - especially if you're constantly pausing your workout to reply to text messages. "During your scheduled workout times, leave your phone in the locker or disconnected so you can focus on the task at hand - without any interruption," advises Forster. The best way to keep yourself motivated towards your fitness goals is to treat yourself when you stick to good habits. "Reward yourself for your hard work - but try to keep the reward as part of your wider lifestyle agenda, such as a spa day or new gym clothes." Forster adds: "It's a good idea to talk about your goals to other people too, and maybe even share them online, as that will keep you even more accountable."